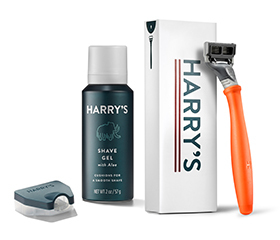 Get Harry's delivered to your door for less than $2 per blade. Start with a trial set—free shipping. Start shaving with our products—shipping is on us. Save on all your shaving products without sacrificing quality. Judge the quality of our products for yourself. Trial lasts about 2 weeks. You’ll get blades based on how often you shave. Free US shipping always. We sell our blades to you directly from our factory in Germany. No middlemen, no upcharges. That's the Harry's way. Today, more than four hundred German engineers, designers, and production workers build and operate sophisticated equipment that produces millions of precision-honed blades per year.